Bisons Design Products There are 22 products. These smart looking carabiners come in various colours and have screw locking system so that it will not come open unintentially. A great way to ensure that something is secure. Please note that these are not suitable for climbing purposes. This Brace Coupler is 1" thick and is made and designed by Bison Designs, made with heavy duty clips and makes walking two dogs together a lot easier with style. 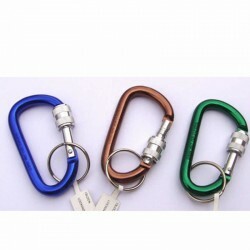 These smart looking carabiners come in various colours, and have a screw locking system so that it cannot come open unintentially. A great way to ensure that something is secure. Please note that these are not suitable for climbing purposes. 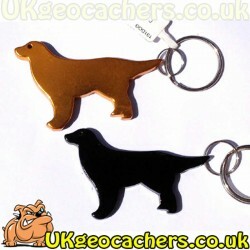 These great Annodised Aluminium bottle openers are a great addition to any canine loving geocachers keyring. They also make great geoswag. Measuring approximately 5.4cm (w) x 5.5cm (h) x 3mm (d) Note: Colours selected from available stock. 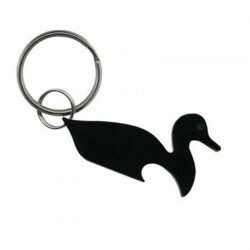 A cute little bottle opener featuring a duck. 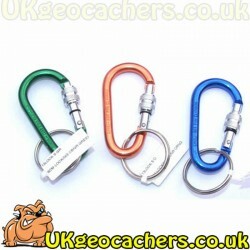 Available in lots of colours these are made to last and will make great geoswag. Measuring approx 5.5cm x 3cm x 6mm Note: Sold individually, colours selected from available stock. 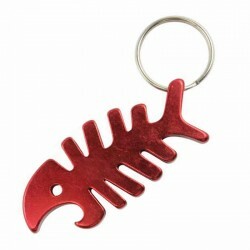 These nice fish bone bottle openers look great. 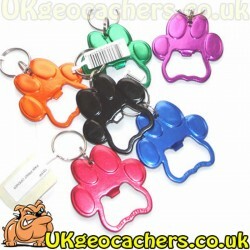 They make great geoswag or a great addition to your keyring. Measuring approx 6.5cm x 3cm x 5mm Note: Colours selected from available stock. Sold individually. These Guitar bottle openers look great. 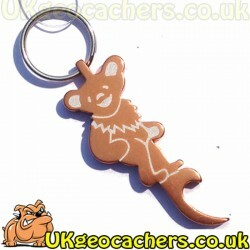 Put it on your keyring or leave as swag for another rocking geocacher. Measuring approximately 7.5 cm x 2.5cm x 6mm (not including the split ring) They can even be attached to a trackable item to travel. 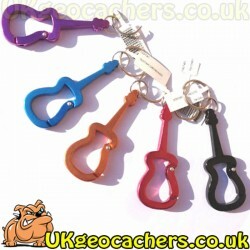 These Guitar carabiners look great and are a handy way to attach something quickly to you keyring etc. 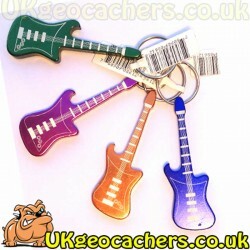 Put it on your keyring or leave as swag for another rocking geocacher. Note: Colours selected from available stock. Sold individually. 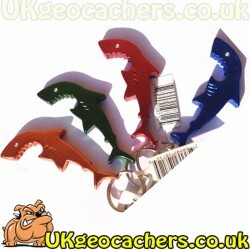 These great shark Bising Design bottle openers will look good on any keyring or in a geocache as geoswag or trade items. 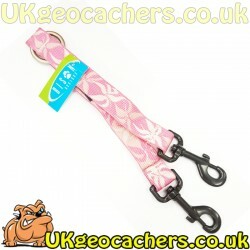 Available in a variety of colours they have real character. Measuring approximately 7.5cm (h) x 2.5cm (w) x 6mm (d) Note: Colours selected from available stock. Sold individually. 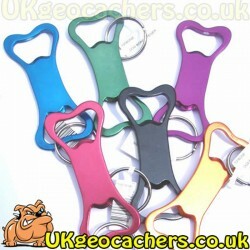 This Bone Bottle Opener is made of strong aluminium and is a great trade item, attach it to your keyring and never be without a bottle opener again. Or even use it as a travelling item. Available in various colours.